I have a message to everyone today. I wake up every morning, check my news feed before getting up. The whole page is covered with dogs/cats that are waiting to be adopted or fostered all around the world. Most of them are abused, injured, sick and need care. The only thing that makes me able to take breath is to see that there are other people trying to help. Small group of people trying to share the photos of these animals, hoping that they can survive before going back to the streets of Turkey. Then I see the news about 100 sled dogs being slaughtered in Whistler because business is not doing well. Deliberate cruelty to the defenseless. They even buried them while they were still suffering. I just couldn’t breath, felt so hurt. Canada is a place where people protect their natural environments and Canadians are proud to have this amazing wildlife and environment.I felt like there is no hope in humanity. I thought if we can’t protect the creatures that depend on our care, there is nothing humane in human nature. Until we show compassion to all living things, we will not resolve anything. I wanted to wait for a day until my anger settles down about the tragedy. Then thought about certain facts that are really horrifying. Perfectly healthy, fully adoptable animals are euthanized for no more reason than a lack of cage space and an unavailability of willing fosters or adopters. All animals in shelters face this potential fate, not just those that are seriously ill or have behavioral problems that make them unadoptable. Then I read a story of one such dog, referred to as “B-10” because he lacked a name. He was “A perfectly nice, perfectly healthy dog. But completely anonymous. And then,” when euthanized because kennel stress led to aggressive behavior after two weeks in the shelter, he was gone forever. All day, I carried this heavy heart thinking that running a marathon is nothing, nothing at all. I wish I can do more, save more. Then I opened my mailbox, and found this card. It’s from Whistler Animals Galore Society, a no-kill shelter. 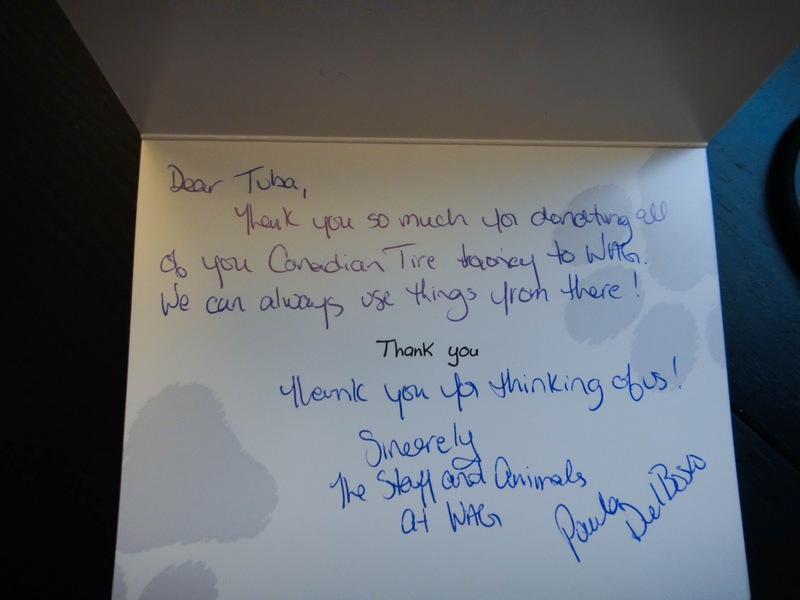 A thank you note for all the Canadian Tire money that we collected…it made me smile for the first time yesterday, a note from Whistler. So that’s all. 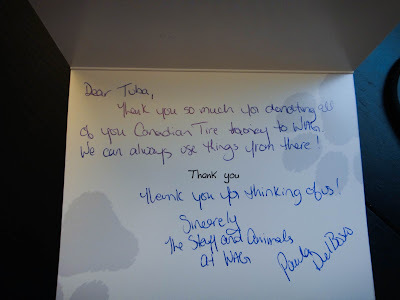 Thank you for stopping by and taking a moment to read this. And thank you for all the support and encouragement. We may not save them all, but at least we can give a second chance to some of these beautiful creatures.